FIRST ANNUAL SPECIAL ISSUE: LIVE AND PRACTICE | 51 Got kids? 4 Summer 2012family Quality of Life & Practice Options friendly cities WINTER 2013 Becoming a physician is hard. Finding a job doesn't have to be. 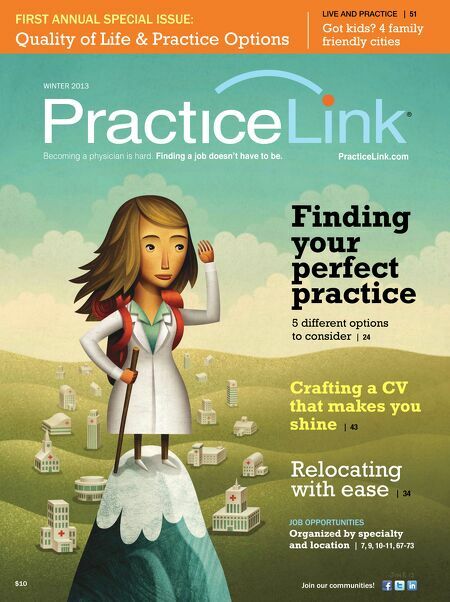 PracticeLink.com Finding your perfect practice 5 different options to consider | 24 Crafting a CV that makes you shine | 43 Relocating with ease | 34 JOB OPPORTUNITIES Organized by specialty and location | 7, 9, 10-11, 67-73 $10 Join our communities!